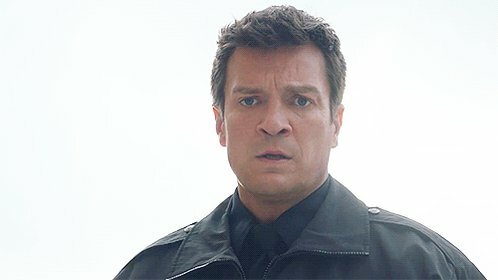 Nathan Fillion is set to cameo as himself in an upcoming episode of The Big Bang Theory, EW has learned exclusively. The Castle star—whose geek cred includes Firefly, Buffy the Vampire Slayer, and Dr. Horrible’s Sing-Along Blog—will appear in the Feb. 19 episode, in which Raj (Kunal Nayyar) and Leonard (Johnny Galecki) see him sitting at a restaurant and debate whether or not it’s really him and whether or not they should ask him for a picture. You can see photographic evidence of that inner struggle above and below. The casting comes as no surprise, considering how much Firefly has played a role on the series. Sheldon (Jim Parsons) is a huge fan of the show and frequently laments its premature cancellation—he initially included a clause in the roommate agreement dedicating Friday nights to watching the sci-fi series since he believed it would last for years to come. Firefly co-star Summer Glau also made a cameo on Big Bang as herself in season two.